Sri Lanka bade farewell to their former test and ODI captain Mahela Jayawardena this morning (18 August) as he helped his side to win the second test and the series 2-0 against Pakistan in Colombo. He scored 54 runs in his final inning of test cricket. President Mahinda Rajapaksa also graced the occasion to witness Sri Lanka’s cricket legend’s final hours of play in test cricket at SSC grounds. 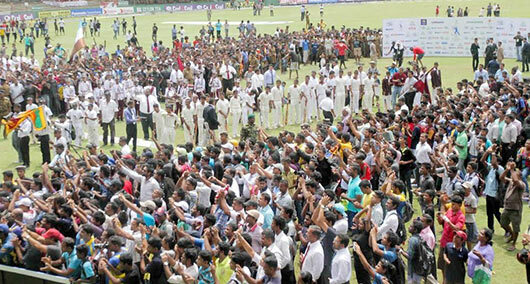 Spectators were let into the ground for free this morning on the final day to witness one of their prolific batsmen, Mahela’s last test appearance as Sri Lanka won the match by 105 runs in the second and final test against Pakistan. The firecrackers were set alight the moment Rangana Herath grabbed the final wicket, his 14th in the match setting a perfect farewell for Mahela. Sentiment ran high as Mahela was carried around the ground by his team mates on their shoulders, in presence of his family, team-mates – current and former, among the hundreds of fans who had come over to say their goodbyes to the legend. The Pakistan team, led by their coach former Pakistani captain and fast bowling legend Waqar Younis, joined in congratulating the batsman. Sri Lanka batting first scored 320 runs for their first innings and 282 runs for the 2nd innings. Pakistan scored 332 runs in their first innings and all out for 165 runs in their 2nd innings. Sri Lanka’s slow left arm orthodox bowler Rangana Herath named as the player of the match for his career-best match-haul of 14 wickets for 184 runs and also won the player of the series award for taking 23 wickets in the two test match series. Sri Lanka cricket legend former captain Mahela Jayawardena played 149 tests matches and scored 11,814 runs in 252 innings. His highest score in an inning is 374. He also maintained a 50 percent average in batting. He had scored 34 centuries and 50 half centuries and taken 202 catches in the matches. He played his debut test against India at R.Premadasa Stadium in 1997 and rendered his service for the team for 17 years. He bade farewell for the T-20 cricket just after Sri Lanka winning the last ICC T-20 World Cup in Bangladesh and hereafter he will play only for the One Day International Cricket until 2015 ICC Cricket World Cup in Australia. 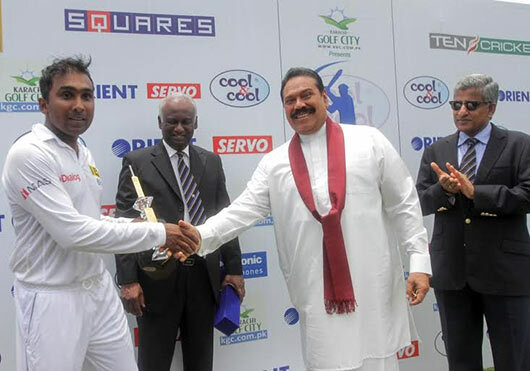 President Rajapaksa exchanged pleasantries with the players of both teams and congratulated the Sri Lankan team for their series win. The president also presented a memento to Mahela Jayawardena for the excellent service rendered for Sri Lanka Cricket to achieve many goals in the international cricket arena. Chief selector of Sri Lanka Cricket Sanath Jayasuriya MP, parliamentarians Namal Rajapaksa and J Sri Ranga, Chairman Sri Lanka Cricket Jayantha Dharmadasa and Secretary Nishantha Ranathunga were also present at the occasion. Mahela is a great cricketer. Hope someone will fit into his shoes well. 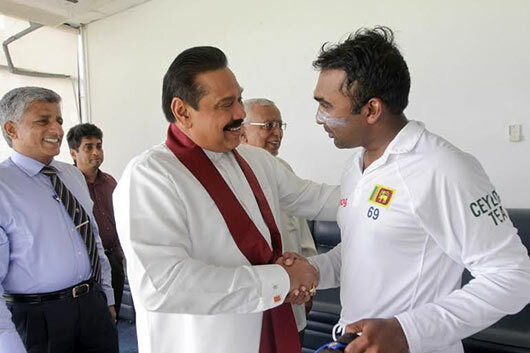 However, Mahela should not follow the footsteps of Sana boy and become a cheap politician!